Meter Wire Binding Machines allows the user to create a professional looking document and is one of the most secure and permanent methods of binding available for office presentation. It is also one of the most popular forms of binding at both a small office level right up to large commercial binderies. Wire Binding is also very durable and ideal for booklets , catalogues and brochures as it allows documents to lay flat when opened and can be turned 360 degrees. When used in conjunction with Meter Wire Binding Supplies documents can be bound together in a matter of seconds, as with Meter Heavy Duty Manual WM740 Wire Binding Machines. 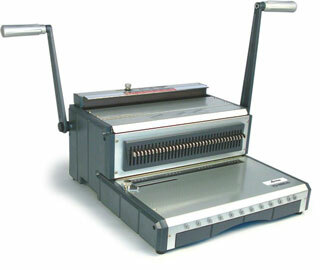 Wire Binding Machines can come in a range of different sizes . The main difference between models is how many sheets of paper can be bound in one document. Another difference between Wire Binding Machine models is how they are constructed. A solid steel Wire Binding Machine will generally last longer than a smaller plastic bodied machine as the punching and binding mechanisms are stronger and can punch more sheets. All Meter Wire Binding Machines come with a standard 12 month warranty. Wire Binding Machines come in two hole patterns when punched ( commonly known as pitches) – 3:1 pitch and 2:1 pitch. Most popular Wire Binding Machines type. Used to bind smaller sized documents. Also known as 34 Ring Wire Binding or Twin Loop Binding. Binds from 5 to 120 pages of 80 gsm paper. Punches holes in a 3:1 Pitch ( or 34 holes on the page). Click here for more information on Meter 3:1 Pitch Wire Binding Machine Models. Wire Binding Machines used for binding larger sized documents. Also known as 23 Ring Wire Binding. Binds from 120 to 220 pages of 80 gsm paper. Punches holes in a 2:1 Pitch ( or 23 holes on the page). Click here for more information on Meter 2:1 Pitch Wire Binding Machine Models. Unlike a manual punch Wire Binding Machines, these models have an Electric Punch to punch the pages before being bound. Often these models come with a foot pedal that triggers the punching mechanism. Great for users who have to do large amounts of Wire Binding. This allows the user to bind documents quickly. 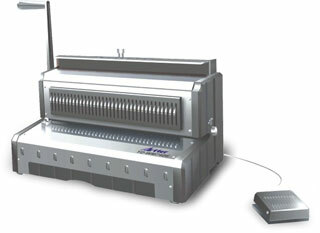 Click here for more information on the Meter Electric Wire Binding Machines. Meter Australia stocks a large range of Consumables to suit all Wire Binding Machines makes and models. These supplies include Binding Wire in 3:1 and 2:1 Pitch in a range of sizes and colours, as well as Binding Covers for the front and back of your document. See the links below for related products and supplies for Wire Binding Machines.